In 2010 I attended the first annual Book Blogger Con, which attracted a number of publishing industry denizens who were in New York as a part of Book Expo (which later took control of the blogger convention). During the opening panel, keynote speaker Maureen Johnson polled a ballroom full of members of the publishing industry. She asked them if any of them had ever heard of "fanfiction." Only about 15% of the room raised their hands. Now I could understand if we were talking some sort of older population whose worldview was entirely dictated by three TV networks and the local paper. 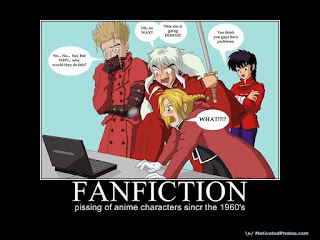 And I could understand if fanfic was some totally new phenomenon that only cropped in the past ten years or so. But fanfiction is literally thousands of years old and even the term fanfic is several decades old. So how in the hell did publishers NOT know about this? This is not "I know about fan fiction but am doing nothing about it" but "I have never heard of this thing you call fan fiction." I can't imagine that publishers are THAT clueless about everything. We're not talking stupid people here. So the only way this makes sense to me would be if the publishing industry is so incredibly insular and so incredibly opaque even to industry insiders that they effectively can't do anything but what they're already doing. But even that seems to be mind-boggling to me. I mean, these publishers must have come across something about fanfic in their personal lives. But to be that dis-engaged with your job that it doesn't even occur to you to bring something you from your personal life into your work. I mean, I'll grant you that not every job is somebody's ideal and that they wake up every morning thinking how great it is to do whatever it is they're doing, but to not bring ANY of their the personally acquired knowledge and forethought to their job seems to me a level of dis-engagement that I haven't seen since I worked at McDonald's in high school. I'll admit to not always bringing the totality of my being into work each and every day, but I use knowledge I gain outside of work to try to make my job better/easier. Now, I don't see this in comic book publishing, but that's very much an industry that you have to love to really be a part of it in some capacity. Don't get me wrong, comics have plenty of their own problems, but being dis-engaged is not one of them. But book publishing? Wow. That just sounds all sorts of messed up if that's how publishers brign themselves to their jobs.